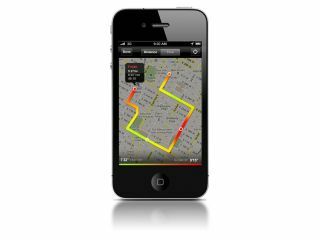 Nike has announced a new version of its Nike+ app - but only for the iPhone 4 and other iOS 4 enabled devices that feature GPS. It ditches the need for a sensor in your shoe, and adds in the much-needed support for GPS tracking. A number of other apps out there, notably the Adidas MiCoach application, have had such functionality in for a while, and offer better accuracy when tracking run speed and distance. The new Nike+ app curiously doesn't support the new Polar Wearlink+ transmitter, which was designed to supply heartrate information to the application - so users which forked out for the band will likely be irked they can't hear their 'power zone' or whatever lingo they use. However, there are a raft of new fancy features in the Nike+ App: a colour-coded pace tracker allows you to see how fast you were running over your route (brought to you using Google Maps). 'Challenge Me' also allows you to race your best, longest or fastest runs and get a gold medal should you kick them into touch - complete with a manly roar at the end. The Nike+ App does cost to buy though, which is a shame as the first iteration was free - you'll need to fork out £1.19 for the pleasure of hearing Paula Radcliffe at the end of particularly decent run.